Greg Hitt reported in today’s Wall Street Journal that, “A proposal to sweeten government support for American sugar producers is emerging as a major sticking point between Congress and the White House in final negotiations on the farm bill. “The initiative is a priority for House Agriculture Committee Chairman Collin Peterson, a Democrat whose rural Minnesota district is among the nation’s top producers of sugar beets. Mr. Hitt went on to explain that; “The industry has long been one of the most protected sectors in American agriculture. The government support includes special loans to producers and a program designed to prop up the prices by controlling the amount of sugar put on the market through import limits and production allotments granted to farmers. “While the program doesn’t cost taxpayers much, critics complain it keeps the price of sugar artificially high for consumers and food processors. “Rep. Peterson is proposing to increase what sugar farmers can borrow from the government, an amount that hasn’t been raised in 20 years. He wants to lock in allotments for domestic producers at about 85% of the U.S. market. “He also proposes a mandate that sugar imports be used for ethanol production. The provision would shield the domestic industry from foreign competition, which has increased after a trade agreement with Mexico and several Central American countries. The Journal article pointed out that, “Two-thirds of spending under the [Farm] bill would be set aside for nutrition programs, most of it domestic aid for low-income families. Even so, the White House is seizing on the global food crisis — and public angst about food prices — to pressure lawmakers on domestic farm supports. Meanwhile, the Friday edition of National Public Radio’s (NPR) Day to Day program devoted attention to the Farm Bill debate. Sen. Tom Harkin (D-Iowa), the Chairman of the Sen. Agriculture Committee appeared on the program and spoke about direct payments and noted that the President has been unwilling to negotiate and deal with the Congress on the Farm Bill. Chairman Harkin also addressed income limitation (both farm and nonfarm related income) levels for receiving federal farm subsidy payments. The five-minute NPR audio segment is available here. The item stated that, “But it is in Europe, with its notorious common agricultural policy (CAP), that farmers are bleating especially loudly. France, which has long scooped up more CAP money than any other country, leads the way. Not long ago, President Nicolas Sarkozy seemed to support CAP reform, asserting that farmers should live off their earnings, not from subsidies. But the French, who take over the EU presidency in July, are now pushing ‘community preference’—jargon for blocking food imports. To get round world trade rules, they are suggesting that imports satisfy EU environmental, hygiene or animal-welfare rules—which give ample scope to rig markets. Peter Harriman reported in yesterday’s Argus Leader (South Dakota) that, “Keith Alverson heads into 2008 looking at robust prices for the corn and soybeans he grows with his father and uncle near Chester. 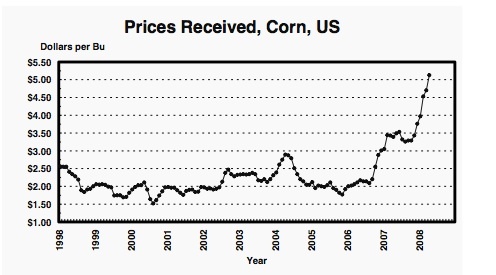 “Two dollars for a bushel of corn – the benchmark price for years – seems like a quaint artifact from a bygone era. 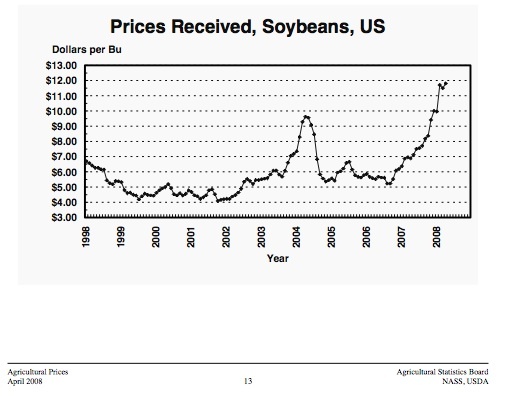 The value of crops common in the Upper Midwest – corn, soybeans, wheat – have doubled and tripled from those old standards. Mr. Harriman explained that, “Old hands who can dredge from memory scenes from one of modern agriculture’s dark days have seen this before. Sky high prices for their crops in the 1970s encouraged farmers to chase the bonanza by taking on greater debt to enlarge their operations. Many borrowed heavily against their biggest asset, their land. In the overheated farm economy, land value soared like the mercury in a thermometer in central South Dakota in July. “But high loan interest rates, a precipitous drop in the price of commodities and a corresponding free fall of land prices swirled into the perfect storm that dashed farming against the reef in the 1980s. Meanwhile, Matt McKinney reported today at The Minneapolis Star-Tribune Online that, “A pair of Minnesota charities, one called Kids Against Hunger and another Feed My Starving Children, sent 70 million meals overseas last year, but in recent weeks have found themselves at the eye of an unfolding global storm over food. Prices are up, costs have skyrocketed, and without more funding they’ll cut back just as the need for food aid mushrooms. “She had hoped to send more meals this year, but economics is playing havoc with that plan. Rice prices started creeping up last fall, rocketing up 30 percent between March and April, she said. So her group is spending $526,000 more to ship the same amount of food as last year, about 27 million meals. Rice has nearly doubled in the past year; wheat is up 69 percent, soy 78 percent. Along these lines, Tom Polansek reported in today’s Wall Street Journal that, “Chicago Board of Trade rice futures have likely seen a top for the year after global supply fears sparked a record-breaking rally, analysts said. “Nearby CBOT May rice has shed 17% since hitting its high of $24.6850 per hundredweight April 24. It settled Friday at $20.55. Most-active CBOT July rice has fallen more than 16% since reaching an all-time high of $25.07. The contract tumbled the daily, exchange-imposed limit for four consecutive days last week and closed Friday at $20.9450. 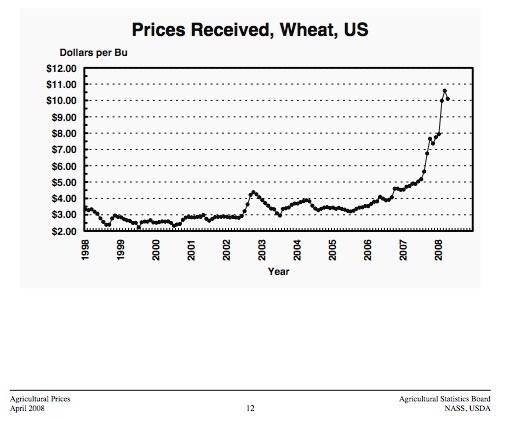 In addition, the Journal article pointed out that, “Wheat is looking more affordable these days, as the price of the most-active CBOT July wheat contract has plunged to around $8 a bushel from $12 in March. Mr. Polansek added that, “The global media focused their attention on rice after prices surged to record highs amid fears about shortages of the food staple. In April, warehouse clubs Costco and Sam’s Club limited purchases on rice because of ‘recent supply and demand trends.’ The burst of attention may have been a signal that the rally had run its course, analysts said. Faith Bremner reported in yesterday’s Argus Leader (South Dakota) that, “Commodity prices began their steep ascent last fall and peaked between late February and early April. Wheat and soybean prices have backed off some since then but remain high. Corn remains near its record high. There are many reasons for this, market watchers say – growing economies in China and India, which has led to a higher demand for food and raw materials, the fall in the dollar’s value against other currencies, a two-year drought in Australia, an increase of speculators in the futures market and increased ethanol production that has diverted corn supplies. The article noted that, “Some in the agriculture industry say speculators are responsible for much of the price volatility. The Commodity Futures Trading Commission held a hearing on the issue April 22. According to the commission, the amount of money that investment funds and others have put in the crop commodities markets has jumped from $10 billion in 2005 to $47 billion today. “South Dakota’s congressional delegation said they’re concerned about the situation and want the commodities commission and Congress to consider new limits on speculators. DTN Political Correspondent Jerry Hagstrom reported on Friday (link requires subscription) that, “House Agriculture Committee Chairman Collin Peterson, D-Minn., said Wednesday that when the farm bill is done he plans to hold hearings on the Commodity Futures Trading Commission and on management problems within the Agriculture Department while keeping an eye on food safety proposals. David Welna reported on Friday’s Morning Edition Program (National Public Radio) that, “Four months ago, Congress sharply raised production targets for ethanol fuel, from the current 7 billion gallons a year to 36 billion gallons by 2022. Now, some lawmakers are asking whether the ethanol mandates come at too high a price. “The mandated, subsidized biofuel uses corn as its main feedstock. Last year’s production required a quarter of the nation’s corn harvest, which has led to soaring corn prices. That led to corn displacing other crops. To listen to this NPR segment (3:55), just click here.